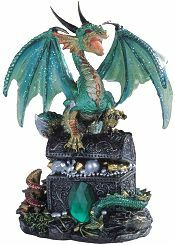 The Emerald Royal Dragon guards his pearl and jewel encrusted treasure chest. Another finely detailed, hand painted figurine that is a welcome gift to any dragon collector. This cold cast resin dragon comes in a gift box with heavy foam packing. 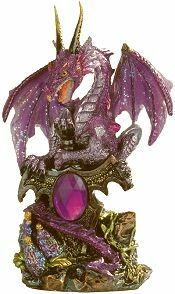 The Amethyst Royal Dragon leans over a jewel accented shield is a finely detailed, hand painted figurine and a welcome gift to any dragon collector. This hand painted and finished cold cast resin dragon comes in a gift box with heavy foam packing. 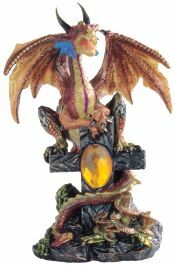 The Gold Royal Dragon perched on a jewel accented cross is a finely detailed, hand painted figurine and a welcome gift to any dragon collector. This hand painted and finished cold cast resin dragon comes in a gift box with heavy foam packing. 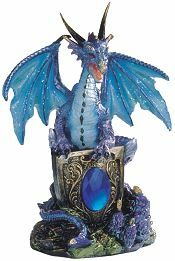 The Sapphire Royal Dragon stands over a jewel accented shield is a finely detailed, hand painted figurine and a welcome gift to any dragon collector. This hand painted and finished cold cast resin dragon comes in a gift box with heavy foam packing. 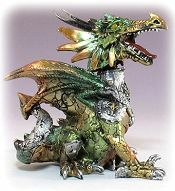 This handsome Emerald and Gold Metallic Dragon with silver accented armor, stands his ground ferociously! This finely detailed, hand painted bobble head dragon figurine is cold cast resin and comes in a gift box with heavy foam packing. 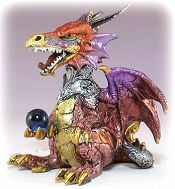 This gold and silver accented Multicolor Metallic Dragon holds a Sapphire crystal ball as he ponders his future actions! This finely detailed, hand painted bobble head dragon figurine is cold cast resin and comes in a gift box with heavy foam packing.